Do you have Cinnamon Toast in mind for breakfast? How about a grilled chicken leg rubbed with Himalayan pink salt and a tinge of lemon and black pepper for lunch? Or, perhaps a nice dark chocolate espresso for the evening? Well, if you happen to see the range of Pink Himalayan Salts and Demerara Sugar range from Artisan Palate, you'll definitely have these delicious thoughts. 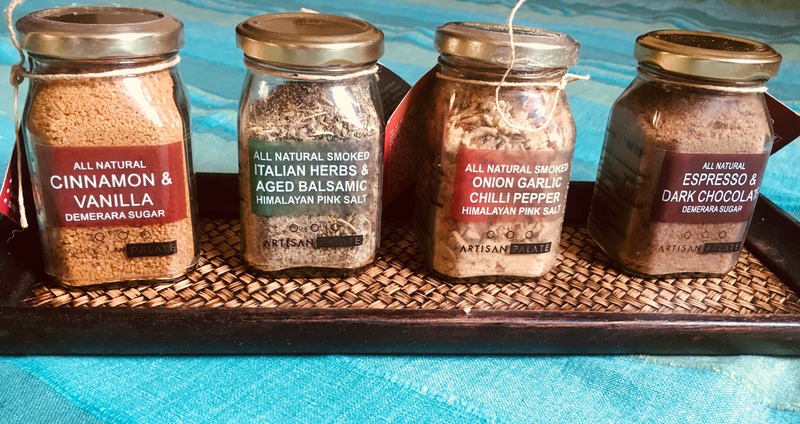 Artisan Palate has come up with an entire collection of all-natural smoked salts and demerara sugars in fantastic flavours to revamp your recipes. I tried out their Espresso And Dark Chocolate Demerara Sugar, Cinnamon And Vanilla Demerara Sugar, Italian Herbs and Aged Balsamic Himalayan Pink Salt and Onion Garlic Pepper Himalayan Pink Salt, and I have to say that these salts and sugars worked like magic in my cooking. These sugar and salts come in easy-to-use, beautiful mason jars with golden lids. I made some out-of-the-world Cinnamon rolls with the Cinnamon and Vanilla Demerara sugar for my kids, which were literally gone in no time. The texture of the mix felt raw and fresh. You can see the ingredients in the jar and it smells heavenly. Anyone can instantly taste and make out that these sugar and salts are 100 percent natural. They've also introduced a range of spice mixes. We tried their Taco Mix and Jamaican Jerk. If you want to add a spicy twist to your tacos/burritos, this mix will work like magic. The Jamaican Jerk is a lighter, less spicy option to add to your grilled veggies, or even curries and noodles; and they're priced really well. They sell mostly online and in pop-ups. If you'd like to try before you buy, you'll just have to order a batch.